No high speed running noise and no vibration ensures the Neo is truly the worlds quietest trainer! The Tacx Neo Smart trainer features a silent, powerful and accurate direct drive delivering ultra quiet and highly realistic road feel. The Neo can be used with/without mains power and is suitable for training with apps on Tablets and Smartphones. The Tacx Neo Smart is their top-end, high-performance trainer to date. Extremely quiet, it is a powerful device to help your training and uses their latest technology and direct drive system to do this. Just like other Smart trainers, the NEO communicates using ANT+ and Bluetooth Smart, allowing it to be connected quickly and easily with Tacx apps. 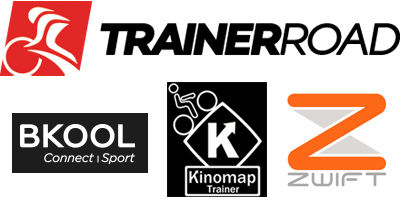 The trainer automatically communicated in all signals and can, therefore, be easily connected to a tablet, smartphone or GPS computer to have your training data in view. Using a tablet even makes an interactive training possible, e.g. with training programmes or videos. The Neo Direct Drive Smart Trainer (T2800) is compatible with various open third-party software platforms, as well as the free Tacx software, that will help and make your training session much more fun and realistic. The direct ride feel is generated thanks to the “real direct drive” concept, with no flywheel the magic happens with 10,000 communication transfers per second creating real-life inertia just like riding on the road. No high speed running noise and no vibration ensures the Neo is truly the world's quietest trainer! The lack of any physical transmission, and in turn any parts that could rattle or rub against each other, ensures this trainer is extremely quiet. In addition, this trainer requires no calibration and suffers no wear and tear. Furthermore, the Tacx NEO features Plugin/Plug out technology and can, therefore, be used with and without a plug. When the plug is not in use, the trainer will act as a wireless motor brake. This means the trainer will not be able to speed up during descents. The NEO represents the ultimate in ease of use. This product is only supplied with a fixed UK specification electrical power plug. An adapter is not included. Type in required words separated by spaces to search across selected mountain bike stores. A space represents 'AND', so all the words you enter will be present in either the product name or category. Use - (minus) to exclude single words and * as a wildcard, eg. roc*. Words must be of 3 letters or more.